Officials identified 19-year-old Nikolas Cruz as the suspected shooter responsible for killing at least 17 people at a Florida high school. He was described as a troubled former student who had been flagged as a potential threat. Nikolas Cruz is taken into police custody Wednesday after the school shooting. The man suspected of opening fire at a South Florida high school on Wednesday, killing at least 17 people, had previously been identified as a potential threat to fellow students and "talked about guns a lot," a teacher and former classmate said. Officials identified the suspect in the shooting as Nikolas Cruz, a 19-year-old former student who was expelled for disciplinary reasons from Marjory Stoneman Douglas High School in Parkland, Florida, where the shooting took place. He was charged on Thursday with 17 counts of premeditated murder. Cruz was currently enrolled at another school in the Broward County Public School District, Superintendent Robert Runcie said. At around 2:30 p.m., he arrived at the school armed with a semiautomatic rifle and opened fire, Broward County Sheriff Scott Israel said. At least 17 people, including students and teachers, died. After firing into classrooms, Cruz was able to conceal himself in the hordes of frantic students fleeing the school, officials said. Nearly two hours later, Coconut Creek Police found Cruz in a nearby neighborhood in Coral Springs, and took him into custody, then to a local hospital for "labored breathing," the Broward County Sheriff's Office said Wednesday night. Footage shows an officer arresting someone who appears to be the shooting suspect. The 19-year-old had been armed with one AR-15–style rifle and "countless magazines" of ammunition, Israel said. Sen. Bill Nelson, citing a briefing from the FBI, said Cruz was also equipped with a gas mask and smoke grenades, but on Friday, authorities said they had found no such items. Cruz legally purchased the rifle in February 2017, according to his arrest booking report, which cited a federal trace. Authorities have not yet determined a motive for the shooting, but Israel said that they were learning more about Cruz through his online accounts. "We have already begun to dissect his websites and things on social media that he was on, and some of the things that have come to mind are very, very disturbing," the sheriff said Wednesday. The Anti-Defamation League on Thursday said a spokesperson for the white supremacist group Republic of Florida confirmed that Cruz was associated with this group and had participated in at least one of their training exercises. The ROF describes itself as a "white civil rights organization" that is seeking to create a “white ethnostate” in Florida. Attempts to reach the man believed to be the group's leader, Jordan Jereb, were not immediately successful, but he told the Daily Beast that while Cruz "probably used" what he learned during his ROF paramilitary training session to allegedly carry out the attack, "nobody I know told him to do that, he just freaked out." According to members of the school community, there were signs of possible trouble to come. Jim Gard, a math teacher at the school, told the Miami Herald that Cruz had previously been identified as a potential threat to other students. Gard told CNN that he had taught Cruz for a semester in 2016 and described him as a "quiet kid" who he "never had any problems with." But the teacher recalled female students in his class said Cruz had "problems with other girls." Cruz's former classmates described him as a "loner" who was obsessed with weapons and "into weird stuff." "He used to tell me he would shoot rats with his BB gun and he wanted this kind of gun, and how he liked to always shoot for practice," 16-year-old Joshua Charo, who went to school with Cruz, told the Miami Herald. 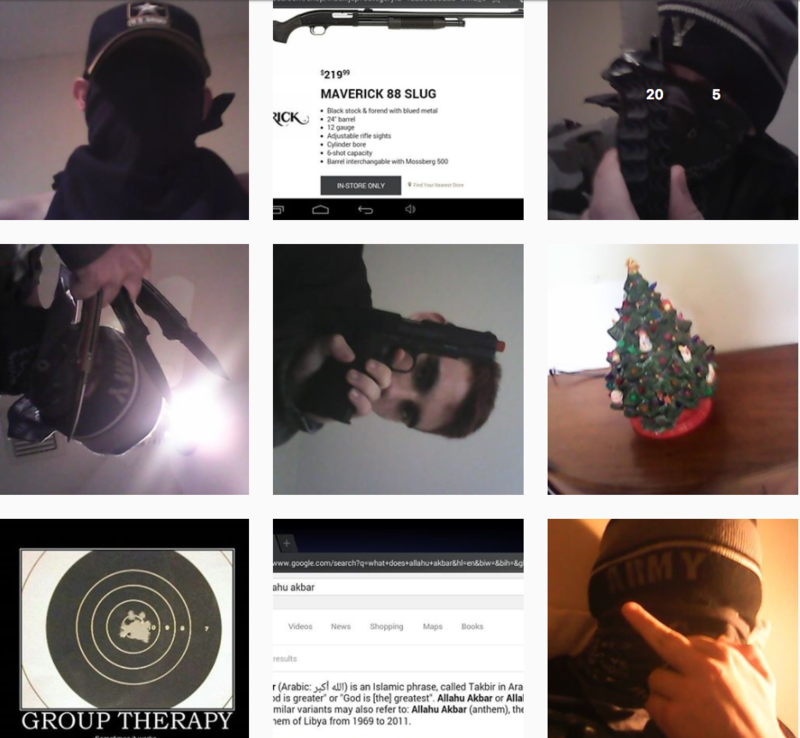 Cruz had at least two Instagram accounts, both of which depict a teen fixated on guns and violence and who was often clad in black with his face covered. In some photos, he is wearing a US Army hat and wielding knives. 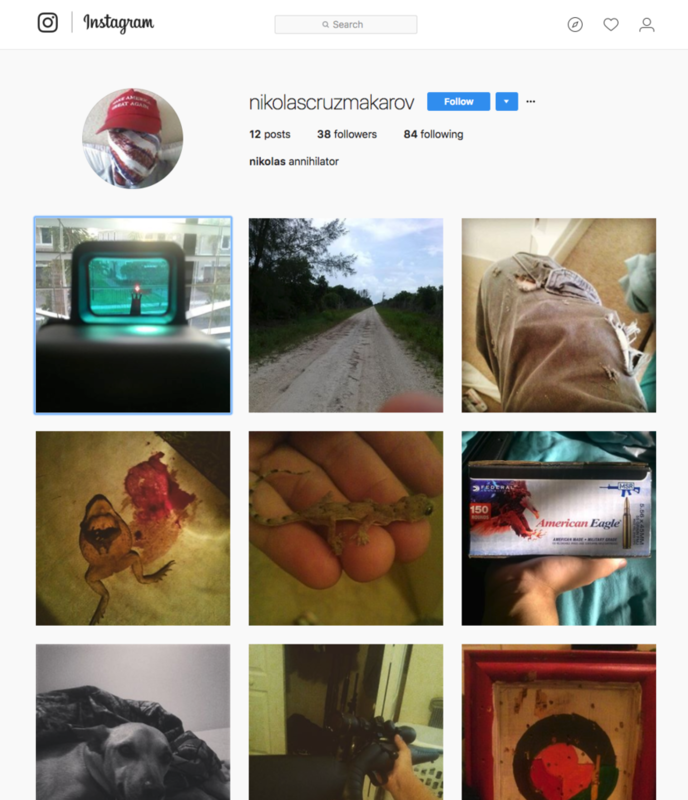 In one profile, under the handle @NikolasCruzMakarov, he is sporting a Make America Great Again hat and his face is covered by a white, blue, and red bandana. A photo from July 17, 2017, shows several guns and a vest laid out on a bed with the caption "Arsenal." Other photos show pictures of dead frogs. He also shared an online ad for a Maverick 88 Slug shotgun. Another showed a bullet-riddled target with the caption "Group Therapy." The post before that one showed a Google search for "Allahu Akbar." Both accounts have since been deleted. In a statement to BuzzFeed News, Instagram confirmed that it deleted the suspected shooter's accounts. "There is absolutely no place on our platform for people who commit such horrendous acts," the social platform said. "We have found and immediately deleted the shooter's accounts on Facebook and Instagram." Giovonni Watford, a former student at Marjory Stoneman Douglas, told BuzzFeed News he was in the same Junior ROTC program as Cruz, and described him as "a sketchy kid." "He was off," Watford said. "He was super stressed-out all the time and talked about guns a lot and tried to hide his face." Watford added that Cruz complained often about bullying on campus and "had beef with one kid." Watford's older brother, Mike, who graduated from Marjory Stoneman Douglas High School in 2016, told BuzzFeed News that Cruz often said "how tired he was of everyone picking on him and the staff doing nothing about it." "Something definitely pushed him," Mike Watford said. Another student at the high school told WJXT that "everyone predicted" something like the shooting and "threw jokes around like that, saying that he's the one to shoot up the school." "He was on the third floor, he knows the school layout. He knows where everyone would be at. He’s been in fire drills — he’s prepared for this stuff," the teen said. "Everyone predicted it," a student said about the #Parkland shooting. A family member told ABC News that Cruz and his younger brother were adopted and that his adoptive parents are now dead. His father, Roger Cruz, died a few years ago, ABC reported, and his mother, Lynda, died in November. Family members told the Orlando Sentinel that Cruz had emotional problems and other issues growing up, and said that his mother tried her best to get him counseling and help after his father died. "He was being a problem. I know he did have some issues and he may have been taking medication. [He] did have some kind of emotional or difficulties," Barbara Kumbatovich, a relative, told the paper. "[Lynda] kept a really close handle on both boys. They were not major issues, as far as I know, just things teenagers do like not coming home on time, maybe being disrespectful." Christine and Malcolm Roxburgh, who lived next door to the Cruz family in Parkland, also told the Sentinel that police had been called to the home "many times." Victoria Olvera, a junior, told the Associated Press that Cruz was expelled last school year after getting into a fight with his ex-girlfriend's new boyfriend. The 17-year-old said that Cruz was abusive while he and his ex-girlfriend were together. After their mother died, the brothers were left in the care of a family friend in Palm Beach County, Kumbatovich told the Sentinel. However, Cruz was unhappy living there and asked a former school friend from Stoneman Douglas if he could stay with their family, Jim Lewis, an attorney representing that family, told the Sentinel. A previous photo in this post identified a student in an ROTC class as Cruz. It is unclear if the person was in fact Cruz, so the photo has been removed.